The application of a Scanair Geothermal heat pumps for aquaculture water heating is the most energy efficient way to heat up fresh or salt water. You can heat up your pond for only a minimum of the cost that other traditional methods might cost. Each year we receive more and more requests and inquiries for geothermal heat pump applications in aquaculture. The benefits are many and your investment will pay back immediately in monthly savings from gas or electric element heaters. You will also have less to worry about because our recommended heat pumps have a titanium heat ex-changer, titanium being the safest metals to use in fresh or sea water applications to protect the aquatic life from the harmful components or metals like copper that most common heaters have. 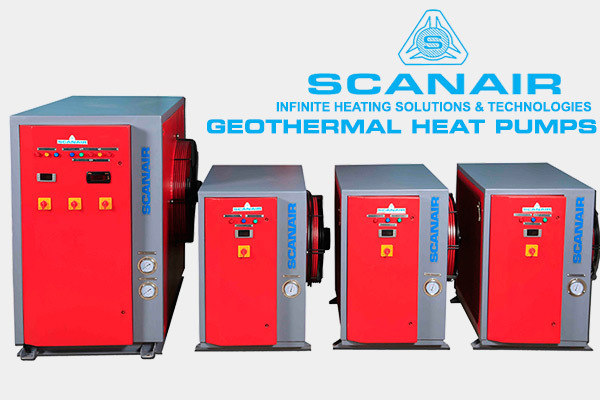 Scanair Geothermal heat pumps designed with temperature range from 24°C To + 80°C ± 2°C, Capacity from 3Kw To 150Kw from 10Lpm To 1500Lpm with different from capacity. Dixell digital display thermostats and world class quality scroll compressors, Titanium heat ex-changers all designed to keep the right temperature in warm and in cold weather. These components will assure the long life and reliability of your equipment and will let you feel at ease knowing that your investment is being taken care of. Our heat pumps come in HEAT and HEAT/COOL versions a full range of capacities, and models available depending on your application and needs. When sized properly your heat pump will provide a stable and constant temperature for your water pond. The digital display thermostat will make it easier to operate with a touch of a button. The geothermal heat pump operates by collecting the free heat from the Earth and moving it to the water using very less electricity to run the unit. 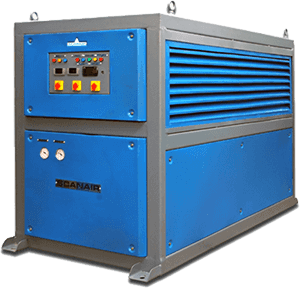 Because of the ability to maintain optimum temperatures and reduce high costs of conventional heating methods, our heat pumps are suitable for Hatcheries, Fisheries, Hospitals, Dairies, institutions, Hostels, Household water heating, Industrial application pre-heating for seed drying, laundry applications, drying application needs, Swimming pool heating etc,. Geothermal heat pumps are a means of collecting the heat from within the Earth’s upper surface level for the use of heating homes, buildings, greenhouses, and water. Because the Earth below 6feet level at a constant temperature, geothermal heat pumps are a great alternative to saving money and energy, even in the coldest conditions, when compared to a traditional furnace that heats the cold outside air. Even in the summer time when the air is hot and hi humidity, the earth surface is cool the temperature always less from outside air. Geothermal heat pumps can be utilized during both seasons. Not only does a geothermal heat pump have the ability to heat the air within a home or building, it can heat the water that leads to the tap or bath tub if properly equipped. This saves on electricity costs used to heat the water in a hot water heating tank found within most local homes. Though the initial cost of installing a geothermal heat pump is higher than that of a traditional centralized air system, the savings are much greater in the long term. Within three to five years the investment will have paid for itself. After that the energy savings in cost will be almost as satisfied as the savings in nonrenewable energy. They use up to 25%-50% less energy than traditional heating and cooling units. The average geothermal heat pump life will lest 25-50 years. Scanair closed-loop ground source heat pumps, a piping loop is buried in the earth below 6 feet ground level, the soil which is considerably warmer than the outdoor air in the winter. Water is circulated through the loops and into the building where the heat pump removes the heat from the water and delivers it to the air. Details of how this is done are provided after site inspection. Since the water entering the heat pump is relatively warm because it is in contact with warm ground, the coefficient of performance (COP) of a GSHP is much higher than a heat pump that uses cold outside air as a heat source. GSHPs can have COPs above 4.0 when there is an efficient connection between the ground and piping loop. The process is reversed in cooling. Heat is removed from the inside air and delivered it to the water loop which rejects this heat to the ground. GSHPs also provide high cooling efficiency since the ground is much cooler than the air during the summer. Scanair Ground Source Heat Pumps are becoming more common as the costs of energy and equipment maintenance rise. When properly designed and installed they not only reduce energy use but lower maintenance costs and extend equipment life since they have no exposed outdoor equipment. They are very simple devices and have only a slight difference from traditional heat pumps. While the added cost of a ground loop, lake loop, or water well is significant, the simple water/ground source heat pump itself should cost no more than a standard heat pump and much less than the interior components of larger building HAVC systems.